I am lying in the tent at high camp on Denali and staring at the bright yellow nylon walls and although it looks sunny outside and feels warm in the tent, I know outside the storm is still going strong. I know, because for the past four days I have fallen for the trick countless times, sticking my head out of the tent only to find a grey sky and blowing snow. The barometer too has been holding steady and giving no encouragement of a change in the weather. We have two more days of food after today which means tomorrow is our last chance at a summit. Our expedition went very smoothly for the first ten days and we rode the good weather into our camp at 14,000 feet to take a well-deserved break. The main challenge for our team was communication. My seven clients were all from Japan and did not speak much if any English. To complicate things, I did not speak any Japanese nor have I ever been to Japan. For the guides this made for some frustrating situations since we could not communicate easily with our clients. We overcame this obstacle using a mixture of communication methods such as drawings, diagrams, and charades. Communication was a slow process and we came to expect that not everyone in the group would understand us and that we would have to explain ourselves all over again, often in rather stressful situations. For example when we traveled on the glaciers, our clients had the habit of unclipping from the rope to wander away in search of a bathroom! Despite the un-roped glacier travel, we all arrived at the our cozy camp at the base of the Mezner Couloir at 14,000 feet and were ready to continue up to high camp after our rest day. On the day we planned to move to high camp at 17,000 feet there were clouds blowing around the summit and it seemed the weather was changing for the worse. When you see those weather indicators on your move day it is worth reconsidering the move. The team could wait out the bad weather in the protection of 14 camp rather than the exposed location of high camp. But we had something else to consider. Another team working with the same guide service was moving down today and wanted to swap camps with us if we were moving up. In a camp swap, two team can trade tents, stoves, fuel, food, and various other items by leaving the camp set up and one team moving up and the other down and into each other’s camps. The benefit of not having to move the weight of camp up to high camp was very appealing and the chance would not come again if we waited for the weather to improve. After deliberating for several hours and talking with the team at high camp via radio we decided to go for it. We packed our things and headed up. We climbed into the weather as we headed for our high camp. The wind picked up and it began to snow, making progress slow. We spent 9 hours climbing to high camp. We were glad to move into the tents left for us by the other team. We spent another 6 hours helping everyone move into camp, make water and eventually dinner. All the while the weather was settling in and the snow was coming down with out a break, but we were safely moved into our camp and I could rest. The next morning I awoke at 7am. The walls of the tent were covered with frost and it was too cold and miserable to get out of the sleeping bag. Every time I moved I would inadvertently shake the walls of the tent and be showered with bits of frost. With considerable effort, I poked my head out of the tent and took a look around. I was greeted to an arctic snowstorm! It was plain to see that a weather system had moved onto the mountain and settled in to stay. With the other teams we anxiously made radio calls to get a weather forecast. By the afternoon it was clear the storm would get worse in the next 48 hours and then begin to clear. We couldn’t help but feel trapped. After inventorying our food and fuel supplies I decided we could stay for five nights or six days. 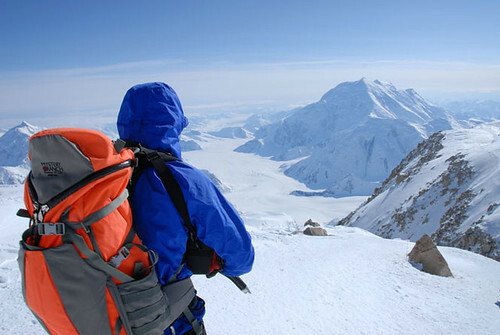 We would be able to summit on the fifth day and then descend back to camp 14 on the sixth. There would be more food and fuel at the 14 camp buried in our cache to support us during our escape from the mountain. That was the best we could hope for. For the next couple of days we went about reinforcing our camp to keep us safe from the storm. We built a second layer of snow blocks around the already existing snow walls that surrounded our tents. We used saws and shovels to cut and remove the blocks from the ground and then stacked them one on top of the other. Inside the walls the wind was blocked and things felt relatively comfortable, but the snow managed to find its way in and began to fill in the spaces around the tents. Every morning we would wake, after spending the previous day holed up in our tents, to the same overcast skies, blowing wind and snow for four days. But on the evening of the fourth day it was evident that storm was taking a turn for the better! It was hard not to get excited at the possibility of a summit day, but we had been let down every morning since our arrival at high camp. We prepared anyway. Packing our lunches and organizing the gear we would need, and topping off water bottles in order to be ready in case the weather did brake for us. Every one was in their sleeping bags and the sun was still shinning on high camp at 10pm. Illuminating the yellow walls of our tents and giving us the last bit of warmth before the cold of 17,000 feet settled in for the night. It was at this moment, lying in my sleeping bag and staring at the brightly back-lit walls of the tent, that I acutely felt all the preparation and work that had gone into putting us in a position to make a summit attempt. I thought back to the hot tarmac in Talkeetna and all our gear and provisions organized on the runway waiting to be loaded into planes for the flight onto the glacier. I thought about how many times we had packed and repacked and organized the food during this expedition. I thought of the heavy loads and the holes we dug for our caches. I thought of all the snow we melted into water to keep us hydrated and all the meals we had made to keep us moving up the mountain. And how many times we had set up and taken down camp and packed and unpacked our backpacks. All this work and effort we had made over the course of the past two and a half weeks and now a mere ten hours was all that was left before we would be on our way to the summit! The satisfaction of having accomplished this moment was thrilling and I could not imagine how I would sleep through the night. Of course I did sleep that night and the morning came with clear skies and a summit push. Lots of hard physical work and the mental toughness to be patient when it counts is what it takes to climb a big mountain like Denali. Damn, it feels good! Our expedition went very smoothly for the first ten days and we rode the good weather into our camp at 14,000 feet to take a well-deserved break. The main challenge for our team was communication. My seven clients were all from Japan and did not speak much if any English. To complicate things, I did not speak any Japanese nor have I ever been to Japan. For the guides this made for some frustrating situations since we could not communicate easily with our clients. We overcame this obstacle using a mixture of communication methods such as drawings, diagrams, and charades. Communication was a slow process and we came to expect that not everyone in the group would understand us and that we would have to explain ourselves all over again, often in rather stressful situations. For example when we traveled on the glaciers, our clients had the habit of unclipping from the rope to wander away in search of a bathroom! Despite the un-roped glacier travel, we all arrived at the our cozy camp at the base of the Messner Couloir at 14,000 feet and were ready to continue up to high camp after our rest day.